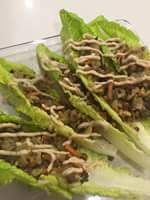 "Majadra-ish" lettuce cups. Brown rice and lentil mix with onions, carrots and parsley, all cooked together with spices, topped with hummus and some lemon! I actually used the filling for stuffed bell peppers in a red sauce, and had tons left over, so this was dinner today. I prepared the brown rice separately, as directed on packaging. For the lentil, I used dried and just boiled them for about 20-25, until soft. In a separate pan I sautéed 2 onion, until golden, then I added cooked lentils, cooked brown rice, shredded carrots, and let it all cook together. For seasoning I used pink Himalayan salt, pepper, cumin (a good amount), tumeric, and garlic powder. Let that all cook together on Med- low flame for about 10-15 minutes and throw in parsley at the end. You can add some eggs to this and make "ktiztot" or pattys and pan grill them. Pepper, I cut the bell pepper along the top, reserving the top of pepper. Stuffed with the filling, and fit about 5 in a pot. You want a snug fit, so pepper don't move. For my sauce I used an organic tomato sauce with green chiles, because I am doing a detox. But my favorite go to stuffed pepper sauce is as follows. Fry some onion, (or you can skip this step and just make sauce in a separate bowl and then add to pot of peppers. Up to you, with or without onion) add small can tomato paste, then add water to make a sauce. Then once boiled, season with chicken consume, pepper, paprika, sugar, and a squeeze of lemon. You can add enough water to cover your peppers to the top of pot so they cook throughout. Poor sauce over peppers, and let everything cook on a low heat for about 30 or until peppers are soft. Don't want to over cook peppers because they begin to break apart.